Great stop for coffee & bagels - Gunther Tooties Bagel Co.
Review of Gunther Tooties Bagel Co. Expanded with a drive thru, all new equipment inside, fresh & clean, &, of course, fine selection of coffee, bagels, muffins & sandwiches for the road. Great stop for delicious commuting food! Ask KVM101 about Gunther Tooties Bagel Co. This is a bagel shop, with fresh made bagels, cream cheeses and sandwiches. The bagels are fresh and delicious, with a variety of cream cheeses and sandwich options. Unfortunately, there prices are very high, considering the fact you are getting a bagel and cream cheese and coffee is also overpriced. Quality is good but not worth the high cost. Ask Bhawk51 about Gunther Tooties Bagel Co. Looking for a place for a quick lunch and found this when we got off to look for a place. Everything was fresh. Bagels looked awesome. No gluten ones. Had a fresh chicken and goat cheese salad that was excellent. On the road to the Cape so an excellent choice for a quick bite. Ask Marna H about Gunther Tooties Bagel Co. Huge selection of great bagels. Any kind of bagel you might want to have & they are scrumptious. Always make a visit when we're in the area. YUM! Ask RonL40 about Gunther Tooties Bagel Co. I needed a quick breakfast but did not want typical fare. I looked on Trip Advisor and found this gem. The counter service was really quick. I had the works bagel and cucumber dill cream cheese. Very very good, The bagel was not super thick but it has lots of flavor. I also had a hot coffee and it was just ok. Great find, thanks Trip Advisor. 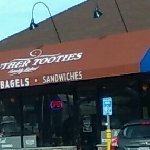 Ask akisha121 about Gunther Tooties Bagel Co.
Been to Gunther Tooties Bagel Co.? Share your experiences!